Almost all of Indonesia’s Gaṇeśa statues are depicted in one and the same posture. In this particular posture Gaṇeśa is seated with both legs bent horizontally. The legs are on the ground in front of the upper body, and with both soles of the feet touching each other. So far, in Central Java only one Gaṇeśa statue is found depicted in a standing posture. 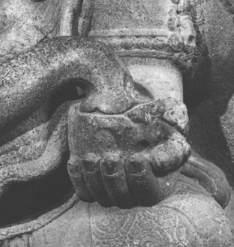 This particular statue features Gaṇeśa standing on the left while bending the right leg. The right leg is held behind the left, like an ascetic yoga posture. It is, however, remarkable that no Gaṇeśa statues in dancing posture are found in Indonesia. This, partially, can be explained by the given fact that, in Indonesia, Śiva statues, too, never were depicted in a dancing posture. 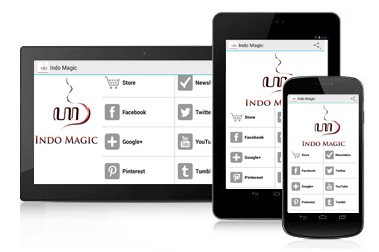 Additionally, neither any other deity has ever been depicted in a dancing posture in Indonesia. In the Indonesian sculptural art, Gaṇeśa is depicted with a tusk (danta), rosary (akṣamālā), axe (paraśu) and a bowl (kaṭora). 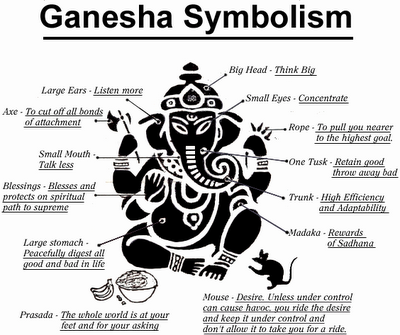 These attributes can be found in almost every depiction of Gaṇeśa in Indonesia. The tusk is usually held in the left hand, and the bowl is held in the right, while both hands rest on the upper legs. The rosary and the axe are held in the two upper arms; the rosary in the left upper hand, and the axe in the right upper hand. The rosary is held tightly, and the axe is held with the blade pointing outward. The bowl is usually round shaped, but sometimes also flat. This particular style of the aforementioned attributes can be found in all Central Javanese statues of Gaṇeśa. A statue of Gaṇeśa is often depicted wearing a dhoti (a traditional Indian piece of cloth wrapped around the waist and legs), a waist ornament (urumālā), a shawl, a scarf (udarabhanda), a belt (kaṭībandha), a garland (vānamālā), a sacred thread (upavīta) and a coronet. Gaṇeśa statues are decorated with many ornaments. A pearl necklace is also seen on the Indonesian Gaṇeśa statues, just like in India, though the design (of the beads) differs slightly. Gaṇeśa wears also bracelets on the wrists and the ankles. These bracelets are made from pearls and cords, and are decorated with flowers. The Gaṇeśa statues from Central Java do not wear earrings, although at a later stage this would change. Then, there is the coronet, which can be seen on the head of the Indonesian Gaṇeśa statues. The coronet usually is rather tall in its design, which is tied in the middle with a cord or a thread. On the front and on both sides the coronet is decorated with a flower or cloverleaf pattern. 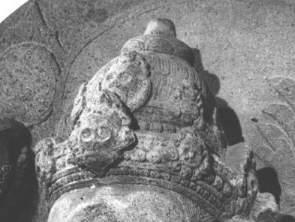 An ornament in the shape of a lotus flower is placed on top of the coronet which often is sealed with a miniature skull (ardhacandrakāpāla). The additional features are the pedestal on which the Gaṇeśa statue is seated, and the little wall behind the actual statue. These additional features of Indonesian statues can be traced back to the Indian Tamil model. The Indian statues of Gaṇeśa also have the rat (Gaṇeśa’s vehicle) depicted on the pedestal, though in Indonesia this depiction of the rat is omitted. 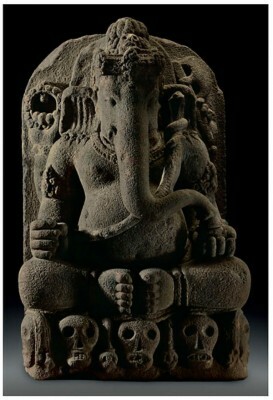 I. Wayan Redig, Gaṇeśa images from India and Indonesia, p.54. 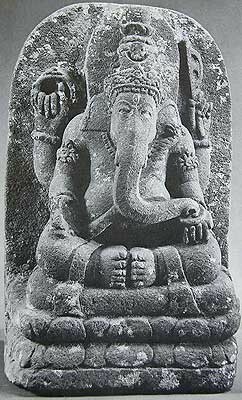 I. Wayan Redig, Gaṇeśa images from India and Indonesia, p.56. I. Wayang Redig, Gaṇeśa images from India and Indonesia, p.57.